The Revoltech figures are something else. 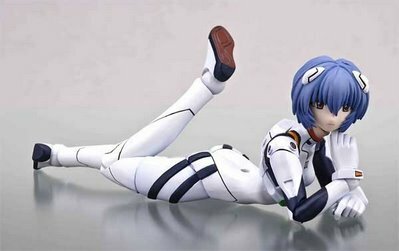 This figure is that of Rei Ayanami who is of course from the hit series Neon Genesis Evangelion. Like other Revoltech figures from Kaiyodo, they have multiple points or articulation, but this one has the new E.L.F. concept giving it a more lively look and feel compared to most other jointed figures. 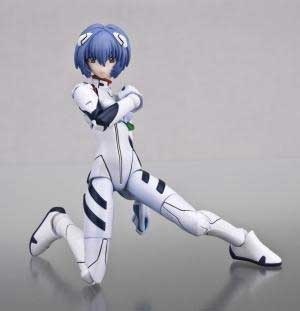 Since Rei is wearing her body suit, this aids in covering the ball joints. It just has that lively look like many of the static figures have. This is a Volume 1 figure so expect some more from this line. She doesn't come state side until mid Feb 08 but you can pre-order her here. Check the Kaiyodo site too as the come up with more from the E.L.F line. ;_; I love Rei so much!! I might look into getting her.